Produced by Good Radio Shows, Inc. This time on Peace Talks Radio, a two-part program. 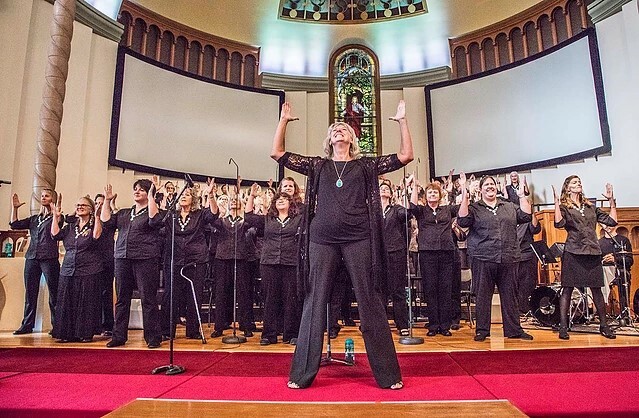 In Part One, we'll meet the founders of the New Mexico Peace Choir, which was formed in 2015 to promote peace and joy and also raise awareness of important issues like the environment. It has grown into a movement and last year represented the United States last at the World Peace Choir conference in Vienna. Members were also part of a world premiere work, The Great War symphony, in November 2018 at Carnegie Hall in New York commemorating the hundredth anniversary of the end of World War I. You'll hear how their performances bring people together and foster greater understanding. In Part Two, we’ll hear from military veteran and long-time peace activist Sally-Alice Thompson who, at 95, is hardly slowing down in her daily drive for social justice and peace. A Navy veteran who served in World War 2, Sally-Alice also taught school for 20 years and, along with her husband Donald founded a chapter of Veterans for Peace in Albuquerque, New Mexico. She’s also a veteran of scores of marches and protests over many decades now.